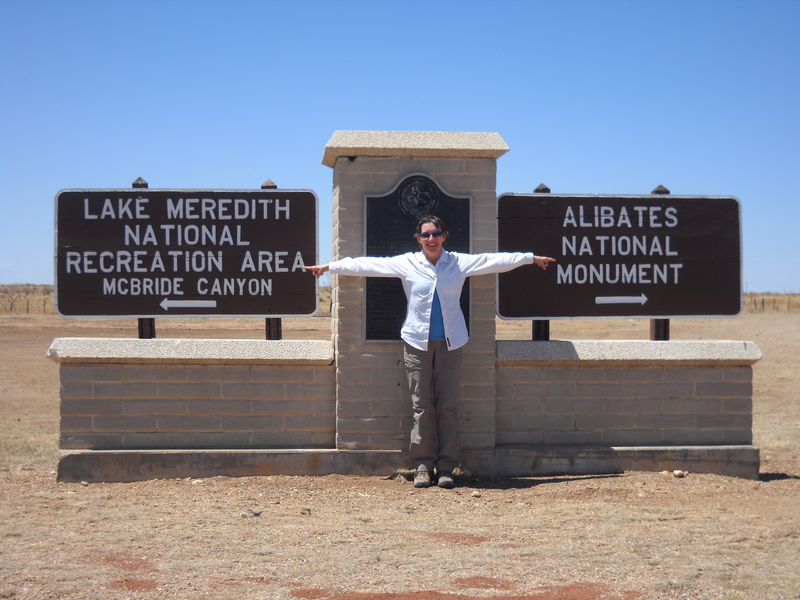 Lake Meredith National Recreation Area – Where is Ruthi? Flint has been used to make knives for over 12,000 years. 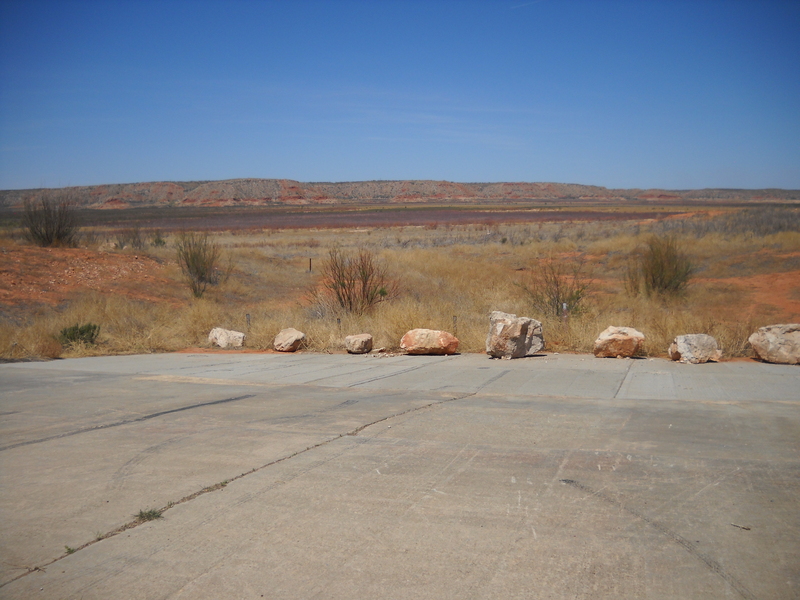 And there is no better quality flint than what can be found in Alibates Flint Quarries in the Texas panhandle near Lake Meredith. Distinctive for its colors, Alibates flint has been found as far as the Great Lakes. 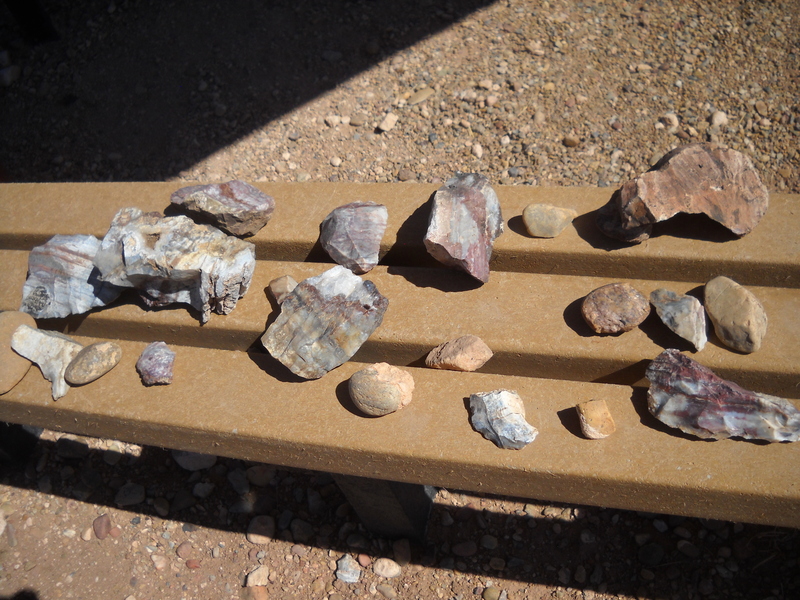 Early Native Americans quarried the stone to be used as tools and weapons, and also for trade goods. Today the quarries are protected by the National Park Service and can only be visited on ranger-led tours with advance reservations. Reservations must be made by phone at least one day prior to arrival. Tours are offered twice a day and take about two hours. Alibates flint is a form of agatized dolomite. It is very hard and very beautiful. The stones vary in bright colors such as pink, gold, purple, and blue and can be streaked with several colors or flaked with shiny speckles of quartz. Alibates flint is smooth, tough, and firm, but can be shaped into points by chipping at it to make very sharp cutting edges. This is called flint knapping. The flint is knapped, or chipped, to make tools and weapons such as knives, dart points, arrowheads, and spear points. 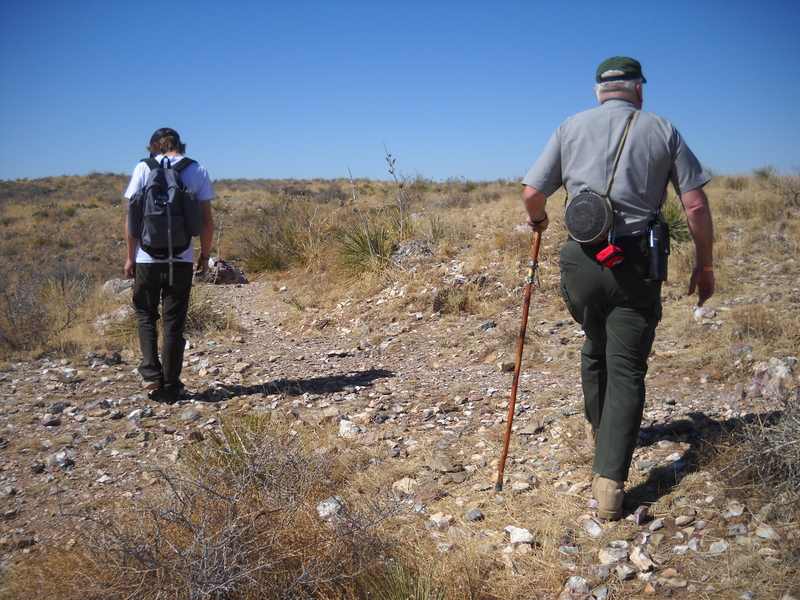 Walking the one-mile, moderately steep trail, it is not difficult to imagine what the area was like over 500 years ago. The tour of Alibates Flint Quarries National Monument passes many small, circular pits located on the hills and mesas where flint formed within the grey dolomite rock. The entire archeological site is littered with flint waste pieces called tailings. The best flint lies just below the surface of the rock and Native Americans dug it by hand or with sticks or bone tools. The waste pieces would be tossed aside and left on top of the dusty soil. I admire the beautiful “trash” flint, each piece unique and colorful. If this is trash, what is quality Alibates flint? As we conclude our tour, the ranger stops once again. We look out over the mesa and imagine what it would have been like to be an early Native American, sitting, digging up the hard flint, listening to the sounds of people talking softly and of rock hitting rock. We look out towards the horizon and see a sight so frightening we think the world is ending! We see strange shapes that blind us as the sun reflects off metal. We see large and small domesticated animals and hundreds of people that don’t look like us and are wearing unusual, heavy, bright clothing. Coronado’s expedition of over 1,000 men and 1,500 horses and mules, cattle and sheep passed by the flint quarries in 1541. Searching for wealth, the Spanish marched through what would later be known as the Texas Panhandle; and unknowingly marched right past two of the riches of Texas: oil and Alibates flint. It is a terrain of flat prairie land perfect for grazing cattle. It is a terrain of canyons with sharp drop-offs and gradual descents. It is a place with harsh, cold winters wet from dense snowstorms. It is a place with dry, windy, dusty summers. It is a setting dotted with energy rich oil wells. It is a setting of fields of windmills producing wind power. It is a setting of fields of fluffy, white cotton. It is the home of cattle and rattlesnakes. It is the home of small towns hosting a courthouse, a Walmart, a gas station or two. It is the home of a busy city hosting national museums, art galleries in people’s yards, chain restaurants, and family-owned steak houses. It is the Texas Panhandle. 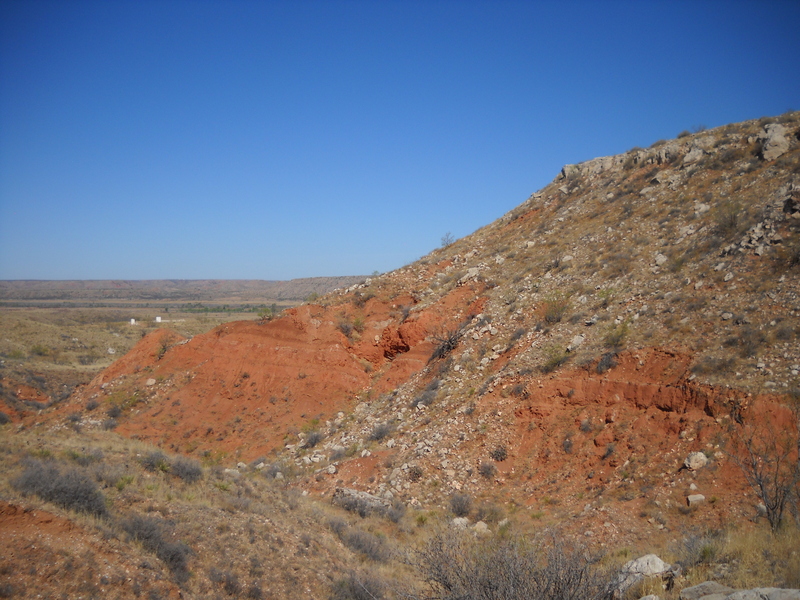 Surrounded by Oklahoma on the north and east, New Mexico on the west, and the rest of the huge state of Texas to the south, the panhandle is the rectangular area in the northernmost region of Texas. This is the perfect place to meet my son, Nathan, for two or three or more days of camping before he reports to his summer job at Philmont Scout Ranch in Cimarron, New Mexico. 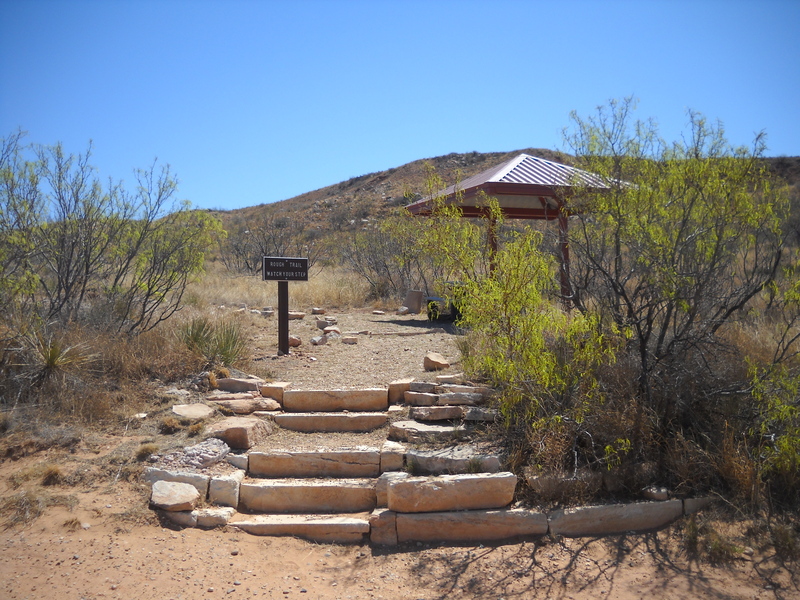 Lake Meredith National Recreation Area, northeast of Amarillo, has several campgrounds with scenic overlooks, picnic tables, shade shelters, and restrooms with flush toilets. 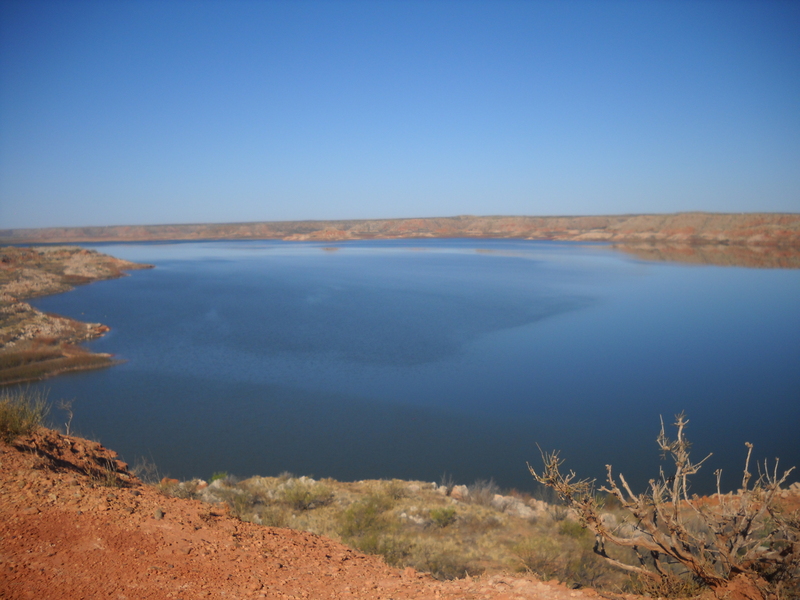 Lake Meredith was born when the Sanford Dam was built on the Canadian River creating a long and narrow canyon lake. 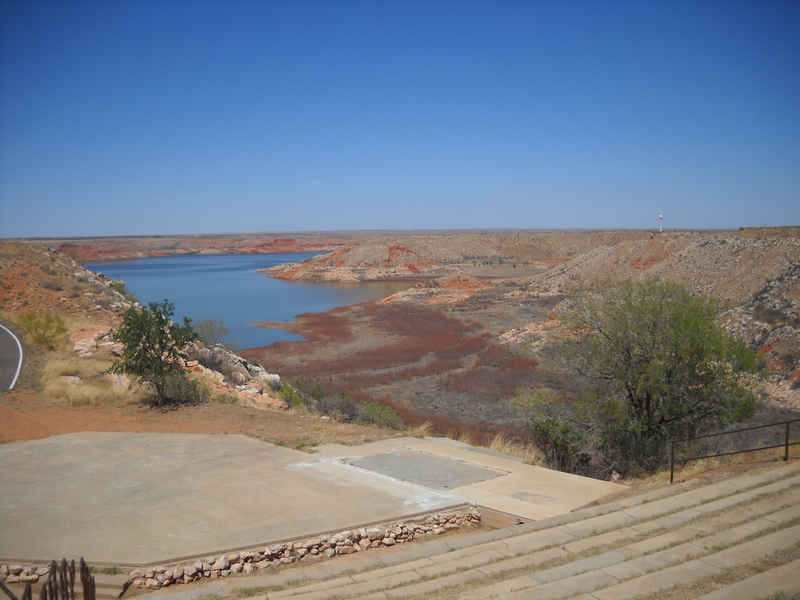 Because this area of Texas has been in a drought for over ten years, Lake Meredith is less than one third of the size it was in the 80s. The nooks and crannies of the side canyons that were once explored by boxy houseboats can now be explored by car and by foot. Walking out into the dry section of the lake is a treasure hunt into the recent past. Items that fell out of boats in the 70s, 80s, and 90s can be recovered without the use of a dive suit. Beer cans with plastic, adhesive pull-tabs and long-forgotten names, old-fashioned sunglasses, broken Timex watches that “took a lickin’, but now AIN’T tickin'”, plastic, aluminum, and glass soda cans and bottles from Dr. Pepper and Fanta, we even found a glass bottle with the simple label “MILK”. Exploring the area of the lake by the dam is equally eerie. A once bustling marina is now deserted. Fishing docks are unattended. There is no indication a supply store ever existed. A mostly deserted lake means mostly deserted campgrounds and this is certainly what I encounter when I arrive at Sanford-Yake Campground. In fact, I can choose whichever campsite I like. And its free! 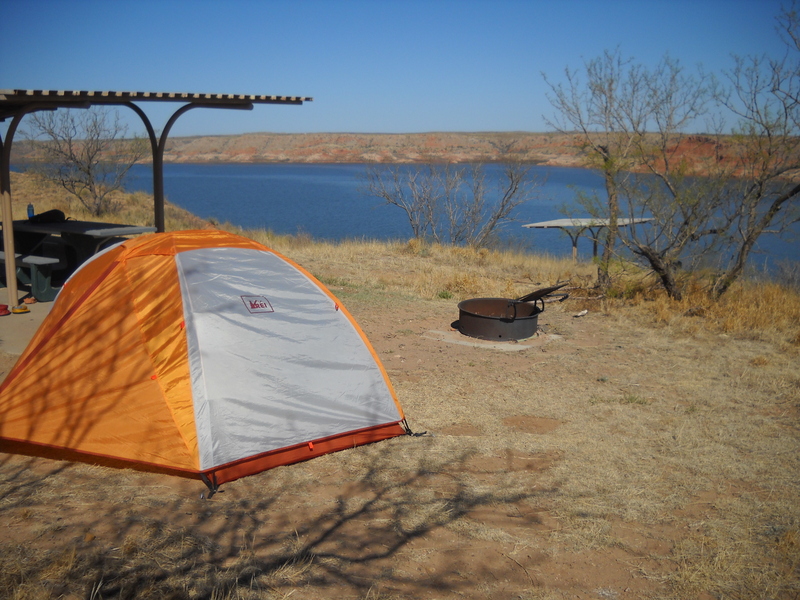 Yes, camping is free at Lake Meredith National Recreation Area. And each campsite has sheltered picnic tables and a view of the lake. Sanford-Yake also has a restroom with flush toilets, a sink, and potable water pumps. I find the perfect site, overlooking the lake but close enough to walk to the bathroom, and begin to set-up camp. The wind gusts common in the panhandle plains make setting up a lightweight backpacking tent a challenging chore. But, I manage to accomplish the task in time to sit and relax and take in the breathtaking beauty of a purple, pink, and lavender sunset; watching and waiting as the golden ball of sun drops completely and suddenly behind the canyon walls of Lake Meredith.